Everyone knows Kendrick B. Blockengramm, rally driver/gymkhana hoon/bro idol that he is. 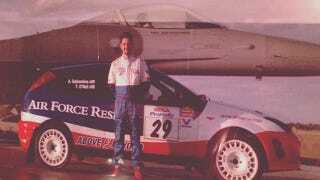 Not as many people know his badass codriver Alex Gelsomino. Alessandro Gelsomino, born and raised in Italy, used to compete in rally himself before eventually winding up as the guy sitting next to Block on his rally runs. And here Gelsomino is, posing like a badass in front of an Air Force jet. One of the pictures hanging in my garage. Year was 2003 and having one of the US Armed Forces as a sponsor was a very unique experience. Good times @fiesta29! How did Gelsomino and Block get together? Well, the first clue is that @fiesta29 is an instructor at Team O'Neil Rally School, where Block got his training to be a rally driver. Back in '03 Gelsomino was the codriver for Tim O'Neil himself, and by '05 Gelsomino was partnered up with Block. Follow Alex on Twitter and on Instagram for great behind-the-scenes shots of life on a rally team.